Places are limited and will be allocated on a first come, first-served basis. Contact us for an application form, using the 'Book Now' button above. Please return your completed application form with a deposit of £60 to secure your place. This week-long music residential for young musicians and singers is designed as an intensive but fun introduction to our folk traditions. It is led by a team of young professional folk practitioners supported by lead tutor Will Lang and pastoral lead Claire Bailey. You will operate as a company: taking warm-ups together, developing technique in music and performance, learning repertoire, and creating new interpretations of traditional material. There will also be down-time to socialise and enjoy being part of an exciting new company of performers! At the end of the week you’ll have the chance to perform what you’ve learned to an invited audience. 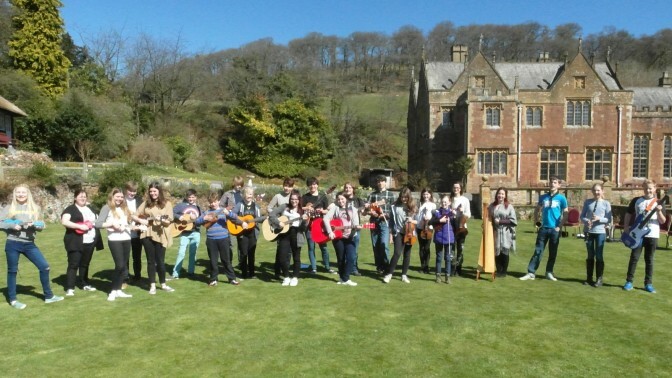 HYF – Intro is just one of 4 courses we run for young people each year at Halsway: HYF Junior is a great way for younger children (8-12) to have fun with folk music; HYF Intermediate (13-18) includes performance opportunities at Sidmouth FolkWeek; HYF Advanced (16+) is an opportunity for musicians and singers considering folk as a higher education or career option to work in greater depth. This course is designed as an introduction to folk for young people aged 12-16 (ie secondary school age). Prior experience – as either a singer or musician – is essential, but it’s ok if you’re new to folk. It’s intensive and hard work at times, but we guarantee you’ll have fun too and make new friends. And if you’re hooked on folk, you can come to our Summer ‘Intermediate’ Young Halsway Week which culminates in performances at Sidmouth Folk Week! Here are a few videos from last year’s event, to give you a taste of what to expect! Each place costs £195 to include full board (accommodation and all meals), tuition and all activities. Places are limited and will be allocated on a first come, first-served basis. Contact us for an application form, or download an application form here. Please return your completed application form with a deposit of £60 to secure your place. The balance of £135 is due six weeks before the course. We do all we can to offer bursary places to young people with exceptional talent or for whom the opportunity would be especially beneficial, but whose financial circumstances would otherwise exclude them from the programme. Email chiefexec@halswaymanor.org.uk if this is something you would like to discuss. Will Lang (lead tutor) is a modern British Folk musician, composer and producer. He is well known for his collaborations, bringing a folk influence to many prolific performers including Mercury Music Award-winning Nitin Sawhney, The National Youth Choir of Great Britain, Tabla player Aref Durvesh and Northern Spirit Singers in the BBCs Choir of the year. It is his work in Folk and wider-reaching genres that enables Will to inspire musicians to discover Folk music and encourage them to explore the roots of their traditional music. His most recent diversion has been joining world-renowned percussion sensation Spark! with whom he has been travelling the world. Will is a former core tutor of Newcastle University’s Folk and Traditional Music degree, founded ‘Hothouse’ at Halsway Manor in 2010 and has been lead tutor ever since. She is currently a member of alternative folk quartet, 4Square, who have appeared at many festivals in the UK and Europe, including Fairport’s 2009 Cropredy Convention, before an audience of 20,000. They went on to sell every last copy of their debut album, 20:20 Manchester, becoming The Cropredy Convention’s 2nd biggest selling band of all time! This will be Nicola’s fourth year as a member of the Young Halsway tutors’ team. Alex Garden is a fiddle player with a unique sound born out of traditional Scottish and English styles. He is well known in the folk scene as one half of BBC Radio 2 Young Folk Award nominees The Drystones (with Ford Collier). Growing up in Somerset, Alex was classically from childhood, but with family roots in Scotland he visits the North West Highlands every year, immersing himself in the landscape and traditional music of the area. Back home playing with Ford, his love for folk music has blossomed. A music degree at the University of Southampton provided the opportunity to be taught by internationally renowned fiddle player John Dipper and to hone skills in composition, production and live sound. In addition to his work with The Drystones, Alex also teaches fiddle, takes part in collaboration projects such as ambient/electronic producer Barnaby Carter’s LP ‘While It Still Blooms’ and works as a ceilidh musician. This is his first year as a member of the Young Halsway tutors’ team! Claire Bailey (Pastoral Lead) discovered a love for traditional music and dance through the Fosbrook Folk Education Trust; she joined aged just eight and enjoyed many wonderful opportunities performing at festivals across Britain and the world. Claire went on to study Folk and Traditional music at Newcastle University, specialising in clog dancing and flute, and now works in primary education; within her school she has developed a choir and music group who are enjoying performing and visiting festivals.